We had the Italian marble cut at the shop because the job was too small for them to come out to the house and keep the cost reasonable. You will need to know the location of the faucet and the drain hole for the sink – as well as the size. Do bring the sink, the faucet and the drain stopper with you. The Italian marble was cheaper then the granite option because of how they cut and waste the sheet. It also needs to be stored on it’s end because it cannot support it’s own weight. If you laid it flat it would crack. The tabletop wasn’t level – after all it was aged, so a wooden rasp was needed to take down the bulges. It also turned out that the heavy marble was putting way too much pressure on the legs. The legs were re-glued, reinforced and the crack in one leg (from the marble weight) repaired. It was filled with wood putty. 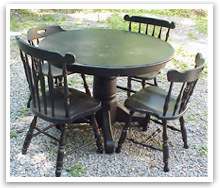 If you are painting (not staining) any good wood filler will work to repair holes and cracks. 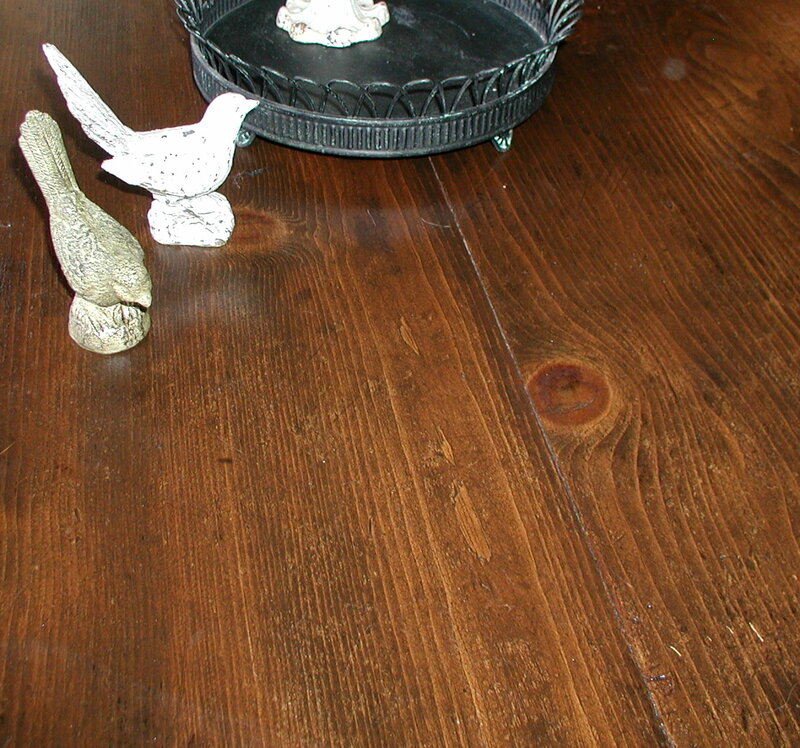 When staining you need to match the wood product (i.e. fill with oak on oak etc…). For small holes I like to use my finger to press the wood filler in and then smooth it out. Once it dries, I’ll sand lightly with sponge block, repaint and glaze to match the rest of the piece. We removed the rollers and put in four more supportive legs that are half hidden by the shelf. This should distribute the weight of the marble and basin evenly from top to bottom. All the legs have new pads on them. I touched up paint and glaze on the repairs before the install. 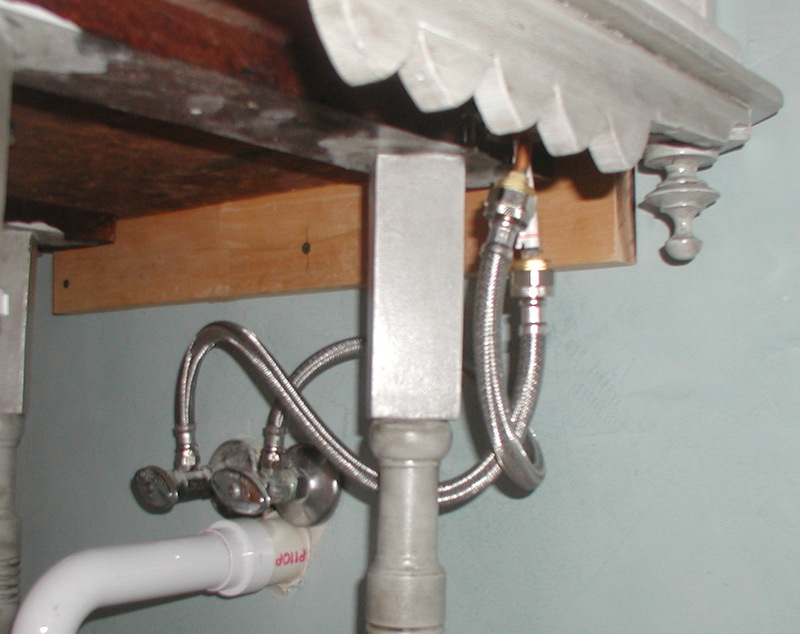 Plumbing was extended from the wall to match the drop of the drain from the sink. Plumbing isn’t complicated but make sure you turn off the water, plug up sewage when it is open to prevent fumes, and use the products made for plumbing such as special glues and epoxys. The table is anchored into the wall with a support at the back underside. Silicone caulking applied in circles on the underside of the marble will afix it to the table. The marble is “rolled” down gently to prevent cracking. The backsplash is applied with silicone caulking to the wall. The sink is installed first, attaching it with silicone caulking on the bottom, and installing it’s drain plug. The faucet is then installed and it is hooked up to the water lines. Marble needs to be sealed as it is porous (just like granite). A commercial product is wiped on before we go to bed – and wiped off in the morning. Definitely if you plan on using marble or granite, buy a table or dresser which can support such a weight. Buy and have on hand all the plumbing equipment before you have the marble/granite cut. Don’t go by the sink hole – get the plug; and be aware that faucets do come in different sizes so don’t “guess” the size. Do a dry run on measurements before you have anything cut. 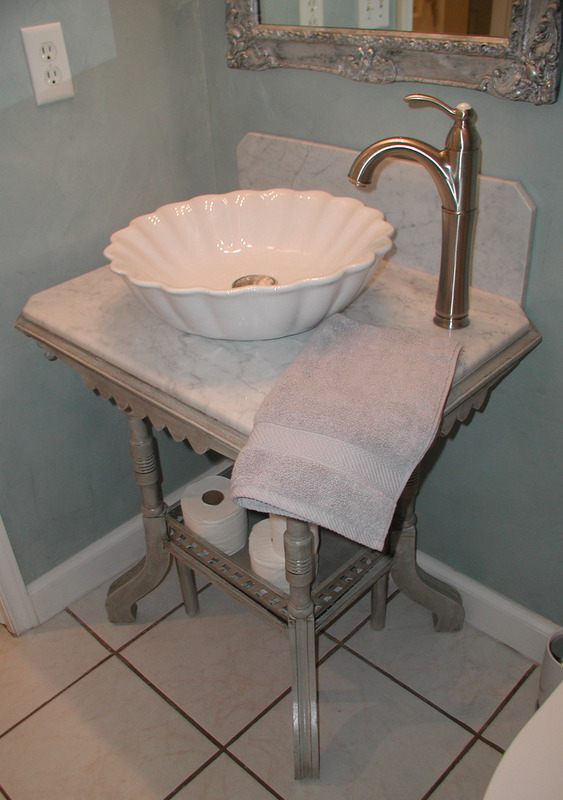 Put the table in the bathroom, especially if the room is small, and live with it for a few days to make sure the space works for you. The original cabinet in the powder room was standard builder work. Though made of nice oak, it was just a box that hung on the wall. With the high ceiling, I always felt it should be a taller to draw the eye upwards. Hubby made a box out of Aspen to mount on top of the existing cabinet. The carved work was recycled from an old vanity harp with very decorative moulding which I had bought years ago ($20), thinking I would make a shelf out of it. 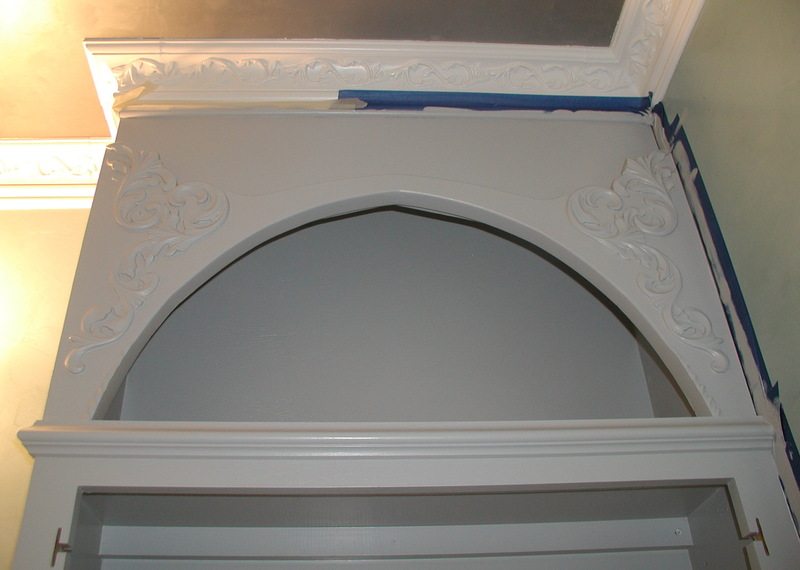 The edge of one piece of the molding was damaged so we used molding epoxy to shape the end piece. The new box was attached to the wall, and molding trimwork used at the top and bottom of the old cabinet to make the unit appear as one. Since the original cabinet had been stained and coated with a protective finish, it had to be sanded down to a point where all the old stain and varnish was completely broken and ready to receive paint. We goofed by not working hard enough at it and the first coat ended up peeling! DON’T SKIP SANDING AND PREPPING! 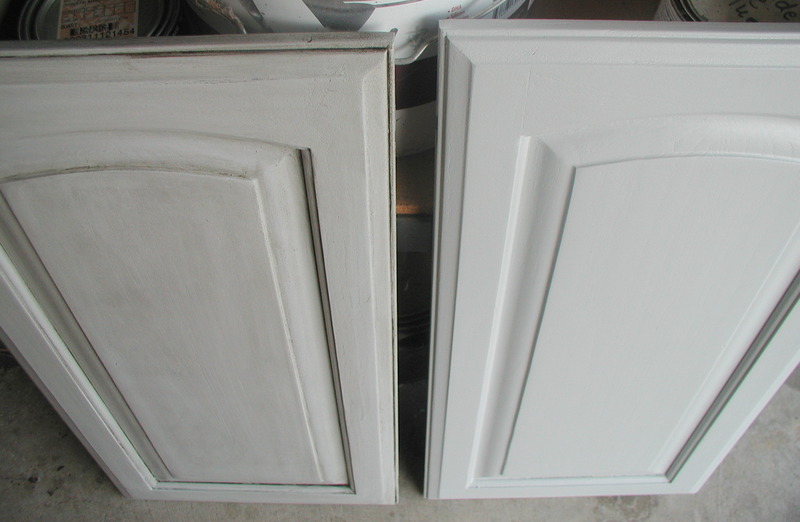 Danielle Hirsch (formerly of Color Splash) has a video here about cabinet doors. She recommends cleaning, sanding, (and on the show – not this video) priming with an oil-based as the first coat, covered with latex paint. If you want a protective cover coat, and used latex paint, use a water-based poly (good) or water based varnish (better) – preferably applied with a paint sprayer. If you use an oil based over latex it will yellow the overall look. Oil based varnishes and poly’s also will yellow as they have a natural amber tint. I apply latex paint with a foam roller designed for cabinet applications along with a 2″ inch bristle paint brush (to push into the crevices). I like the foam because it leaves no marks when you make the last pass. 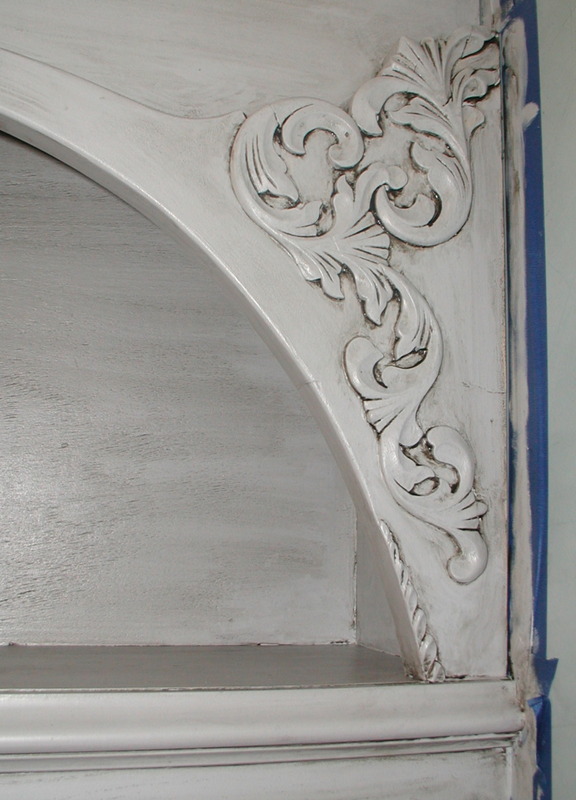 In this case the undercoat color was Valspar Waverly Classics – Gull W38006A. The gray was lighter then I wanted the end product which was deliberate as I knew the glaze would darken it somewhat. Thickly apply the Valspar’s Antiquing Glaze, a black glaze over an area you can work in about 15 minutes (dilute with their clear glaze for longer working time if you need more then 15 minutes) . With a clean rag (cut up t-shirt), work the glaze into the crevices with a circular motion. The crevices is where you will want the glaze to remain so you remove the glaze from flat surfaces. If you have removed too much glaze, just reapply with your paintbrush, working it back into the crevices. The end wipe should be in the direction of the wood. For example the long sides were an even stroke all the way across; the short sides an even stroke. Match the wood grain with your strokes and lift off at the end so there is no end mark with your rag or brush (similar to dragging). 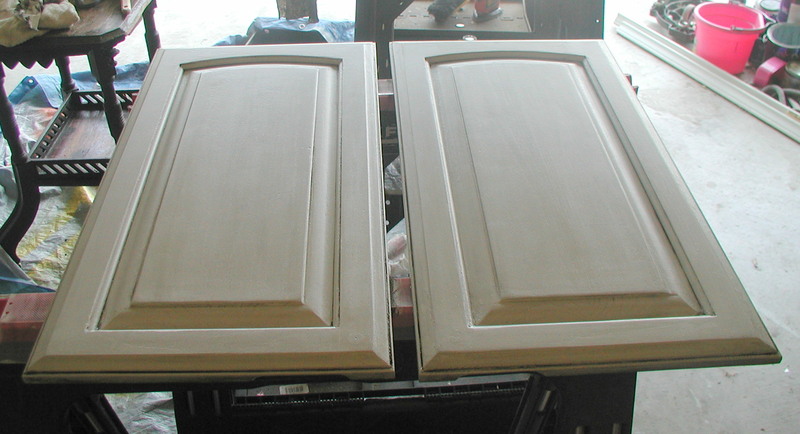 Once the second door is finished, the two doors are compared to make sure the glaze looks the same on both doors. That’s why it’s best to have one person to do the project, the amount of pressure, amount removed, will be more consistent. Three coats of wipe-on, water based poly with the 2nd coat steel wooled. If this bathroom had a tub/shower, I would have used a different topcoat as the wipe-on poly isn’t extremely durable but will be fine for the light use of this room. Want to see more about cabinets? There’s more on the blog right here…. Room: Laundry area ~ finished! The shelves and pantry were helpful in storing items, but they gave the room a claustophobic feeling. The off-white color of the cabinetry did not help the room look “clean” or fresh. The room looked like an after-thought; the unframed bulletin board contributed to that feeling. The light from the ceiling fluorescent fixture, though serviceable, gave the feeling you were in a warehouse. 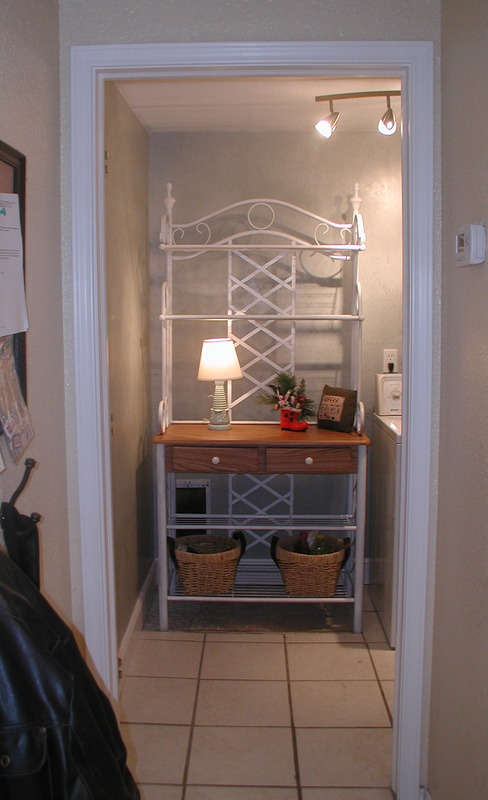 Here are the finished laundry room photos! Walls ~ While the Venetian Plaster was a huge pain in the neck, I LOVE the look as does hubby. I was really surprised at how much dimension it adds an otherwise blah room. Wall Art ~ I looked at a lot of art for this room. Originally, I was considering some sepia toned, beach prints, but decided to try this photo, pop art of flowers. Boy, I was glad that I did! I brought the orange from the flowers and added it to the bulletin board’s frame with spray paint. Lighting ~ I love, love, LOVE the new track lighting. Anything less then 6 lights on the system though would have been too few. Furniture ~ The Baker Rack has worked out even better then I could ever imagine! Because it is located at the hall that opens into the garage, it’s a great place to put schoolbooks, gloves and shoes. Since we don’t have a mud-room this become really helpful during our recent bad weather. I found this Bakers Rack on Craigslist, and liked the lattice, criss cross, pattern across the back. 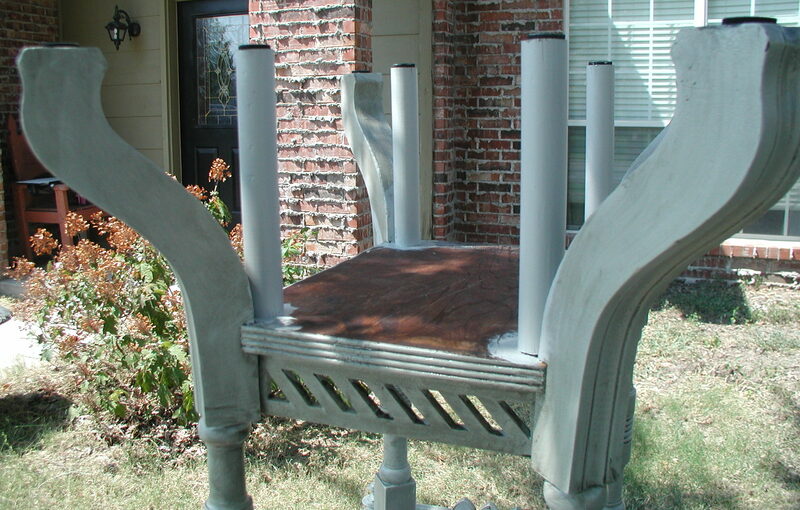 It was a putty colored – I spraypainted it white; I also changed the finals (top of the unit) to ones from my daughters four-poster bed (it was damaged years ago and I kept the pretty finials). Appliances ~ LOVE my new front loaders… I found these 3 year old, GE machines on Craigslist for $750. Most likely I’ll be buying pedestals to raise their height, better concealing the plumbing behind. Molding ~ Clothes rod was boxed in with framing to hide it when entering room. Just that little touch makes the room more elegant. The molding to conceal the clothes rod and the more expensive shelf made of Aspen, all painted fresh white, as well as the larger base molding, again, gives the room added *zing* and a luxury look. This, again, surprised me as I didn’t think it would have as much impact as it did. Replaced our older washer and dryer units with front loaders ($750 – 3 years old from Craigslist). Venetian Plaster, Lowes, Marmo color 4 gallons at $38 per gallon. Additional cost for sandpaper and for final, gloss coat material. Molding color is Chef White from Valspar (Lowes) about 1 quart, had on hand. Additional costs for finishing nails and caulk. Spraypainted Bakers Rack white and replaced knobs with ones on hand. (BR $25 + $16 paint). Note: Repair of missing tile will be done in the future – we still need to find a compliment to what is already there. Except for the floor tile patch (we still need to find some matching tile), the laundry room is now completed. About 8 months ago, Daughter started talking about re-decorating her room again. Now age 12, her previous room incarnations hadn’t really pulled it all together and used colors, as well as furnishings, that she was not that keen on. Turns out she has the heart of a modern girl, not one into pink, flowers and frills! First we started by having her pick out the bed linens. These would be the INSPIRATION PIECE to plan the room off of. This duvet cover was bought from Bed, Bath and Beyond, and the duvet was bought on deep discount at J.C. Penny home store. Probably about $200 in all when you consider pillows and sheets too. 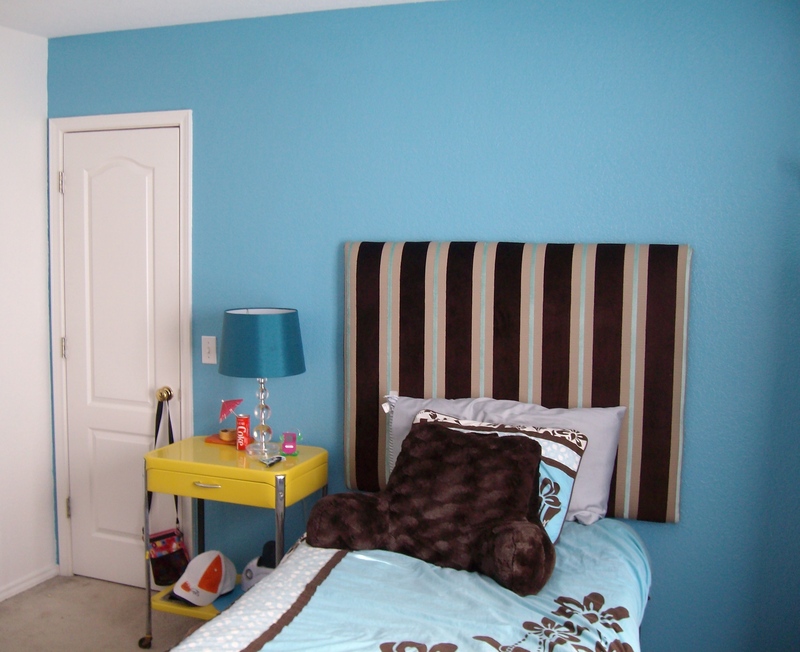 Wall Paint: The walls colors were originally a soft pastel pink. They got re-painted with semi-gloss interior with Valspars’ Betsy Ross House Blue (5002-8A) and American Traditions’ Chef White (7002-15), about 1 gallon of each. Chef White is also the color of the trim throughout the house so it made it easier to just paint trim as well as the wall. I used semi-gloss paint as this girl is tough on her walls and I want to be able to clean them easily. Semi-gloss is more commonly used in high traffic areas such as bathrooms and kitchens. She wanted a feature wall (the blue wall the bed is against) something I usually don’t do but it turned out super cool so I may need to re-think that! NOTE: it took a FULL WEEK for the paint smell (open windows and fan going) to really be gone. We did the painting when daughter was out of town with grandparents and are really glad we did. Bed – the original four poster had been bought years ago and suffered a lot of damage. Two of the posts had been swung on by the daughter and splintered off. We chopped off the remaining posts and spray painted the frame Valspar Java Brown just to fade it away. Mattress was still good. Headboard – (above photo) Came out a bit more expensive then I wanted… Daughter has great taste but also champagne taste! She picked the most expensive, upholstery fabric in the store (Interior Fabrics), thankfully it was on sale, 40 percent off, for a total of $50 and I have to admit looks fantastic! Upholstery fabric is much wider fabric that that which is sold on bolts so this also saves money on “wide” projects. Foam was another $50 and with wood for the frame, came out to be about $125. The side table was a great find and it switched the accent color from pink (not my daughter’s favorite) to yellow which I think makes the room a bit more cutting edge. 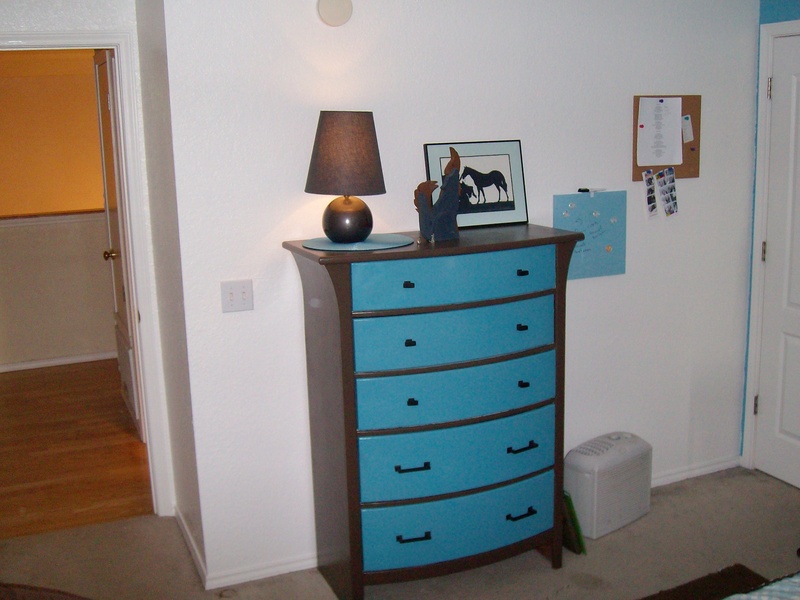 Dresser – The chest of drawers ($40 on CL) were originally stained brown but had been sanded before I bought them. It actually took me some time to find a chest of drawers that had a modern feel to them. This one has clean lines, no additional molding, bowed drawer fronts and flared sides. The only drawback was that the drawers cannot be removed so painting was more time consuming then I had planned. I painted the frame of the chest Valspar Swiss Chocolate 3010-10 semi-gloss, and the drawers were spray painted with Valspar’s Mediterranean Blue. The unit also needed a new back (it had been splintered). The hardware (picked by daughter) was the most expensive part of this, coming in at $60 for a total of about $120. Glass Computer Desk – from CL at $50. I really lucked out finding this piece for this price! Anything the eye “sees through” can help make a room seem bigger. Also I love the modern feel to it. Desk Chair – bought from a 1950’s Retro store for $40. We will be recovering it in the very near future. This price was a bit high for me but I knew the daughter was going to want a comfy lounge chair vs. a streamlined modern office desk chair (my preference) and I was right! Bookshelves – were made by hubby years ago and will be repainted next week in the colors of brown, white and blue. I’ll post an updated pic when done. 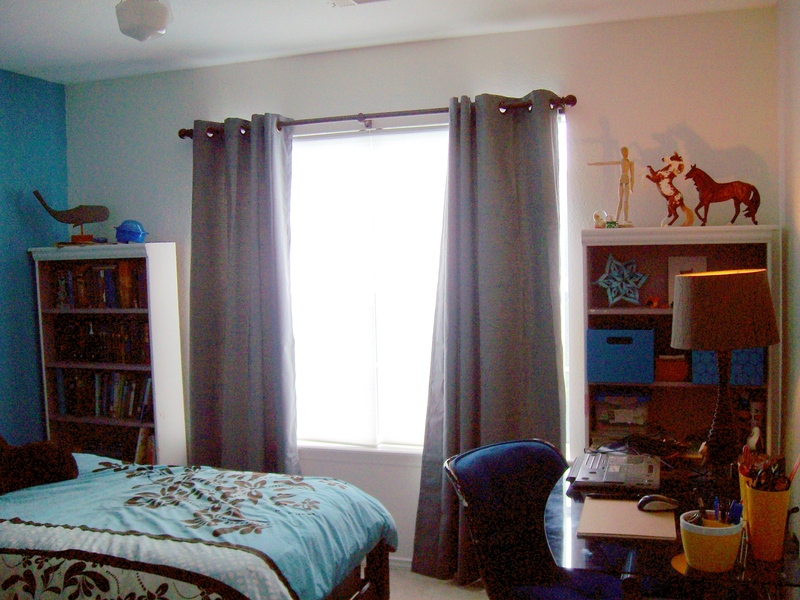 Windows: The heavy 6′ long, 2″ white, faux wood blind was hard to move up and down being that it spanned 6′. They also got horribly dusty and were hard to clean. I switched these out for white cellular blinds that have no cord and go up and down with a touch. 35″ in length, from Bed Bath and Beyond $35 each. This window faces west and gets a lot of late afternoon sun so two, brown thermal window panels with a block grid of icey-blue lines of color were bought from Target ($25 each). The wooden curtain rod pole was one sale from Lowes at $18. It was black, so I spraypainted it Valspar Java Brown to match the room. 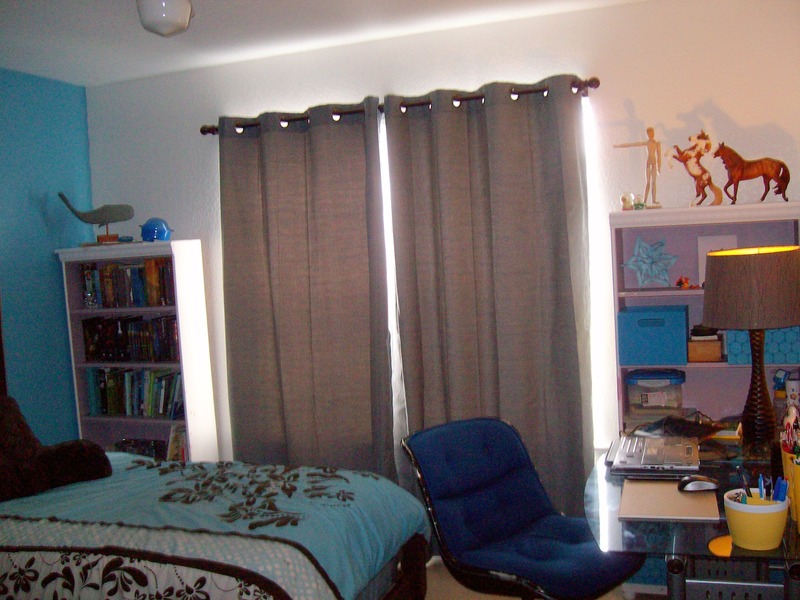 Altogether the window treatments were expensive – about a total of $160-$180. However, I’ve already found that her room is staying cooler throughout the day if the blinds are down and the curtains pulled. Lamps – Lighting for this room was always a problem. She had too few lights and not the right lamps for tasks such as reading, desk work and night light. This was another bigger then expected investment but the result was so cool and functional I don’t regret it. This brown, desk lamp was from Pier One ($50). The original Pier One shade I didn’t like so we switched it to another lamp and bought a replacement shade from Target ($20). The round, brown ball lamp with shade (see photo of dresser) was bought on sale from Lowes ($17). 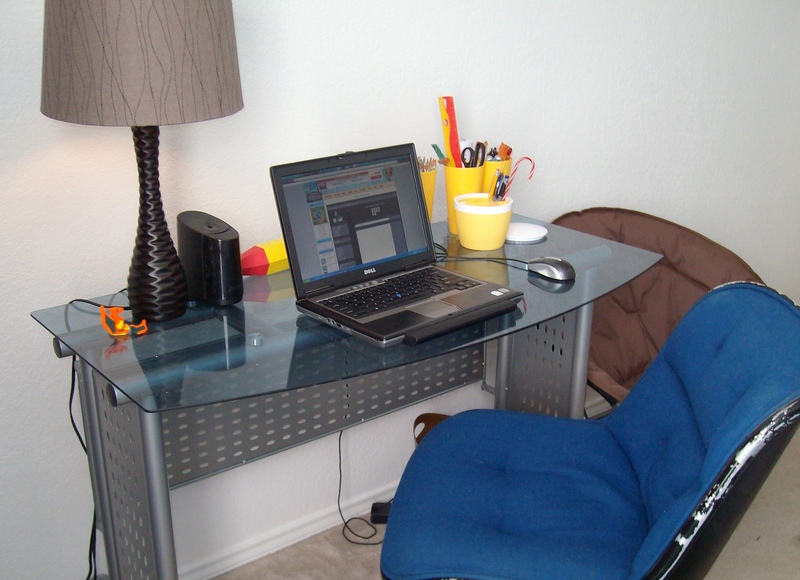 The clear, stacking ball lamp (see photo of yellow table) with separate shade was bought from Target, $38 total. Storage boxes – Another purchase from Target at $10 per box. Daughter loves sorting and containers for her collection. Desk Accessories – in yellow, bought from Target from the kitchen (plastic glasses) and bath areas (storage container with lid). Magnet and Cork Boards – 4 from Target $20 each. Brown Armchair Bed Pillow – Bed Bath and Beyond $20. This was purchased because she loves to read in bed and this should save wear and tear on the headboard. Still to be done: new carpet and adding more yellow accessories. Personally, when I watch HGTV’s Decorating Cents, it blows my mind that they can do a room for $500… I simply don’t believe it! Whoever, bought paint for $12 a gallon and then had enough to do an entire room with it!? Even a small room like this will take at least 1.5 gallons of paint. This room ended up being far more costly then I had planned, however, it has such good bones now it should last her well into her teen years with minor changes.